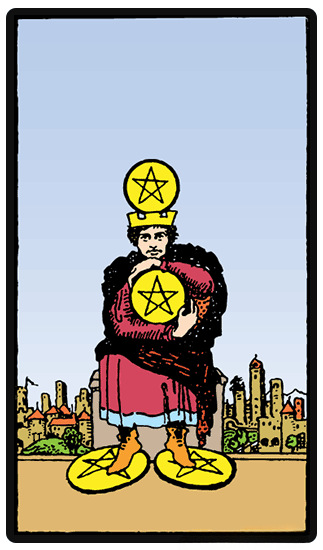 The Four of Pentacles card is capable of generating both negative and positive perceptions. On one hand, the card signifies that you have successfully managed to accomplish much of your goals and you have managed to attain a significant material wealth in the process. However, on the other hand, there is a significant chance that you will start valuing things only for their material worth. You have worked hard to get to the point where you are now, and it is absolutely natural for your to desire to make sure that you remain stable. But this also has a chance to turn you into an overly possessive or greedy person who wants to ensure that no one is capable of taking away your own wealth. There is a chance to turn you into an overly possessive or greedy person who wants to ensure that no one is capable of taking away your own wealth. The Four of Pentacles is also a card which shows that you are currently in a position in which you have solid investments and that you are financially stable. Because of your new-found wealth, you are being particularly conservative about money, and you are most definitely not inclined to gamble when it comes to any kind of financial matters. You are protective of what you have managed to accumulate throughout time, and you desire to steadily increase your overall net worth. Be aware that without risk, there is no reward - if you spend too much of your time attempting to conserve, you may become a prisoner to your own material possessions. Wealth is a kind of energy as well, and we create what we express. When reversed, the Four of Pentacles veers sharply into the negative meanings of the card. Instead of being protective you become greedy, and you succumb to stinginess. You are haunted by certain fears of poverty which compels you to be nothing but materialistic. You are incredibly self-protective and defensive in terms of materialistic things, and you are not opening up to trust other people out of fear that they may be taking them away. On the other side, you might actually be spending too much money, and you need to start getting a proper hold of your actual financial resources. In any case, the card is capable of inducing both positive and negative associations, and you need to be very accountable and considerate if you get the Four of Pentacles in a reading.